Stephen King is probably the most famous American horror author, and he is well known for setting many of his stories and novels in and around the region of Maine where the author lives. Most of the stories are set in fictional towns like Castle Rock, Derry, and Jerusalem's Lot, and if you caught the flowchart I shared back in March then you probably also know that many of the stories are set in the same fictional universe. Today I have a new chart which includes The Dark Tower, and it is even more complex than before. You're going to need to click on this one and view the full sized image. And even after you do that you'll also need to squint; the image isn't as big as it needs to be. 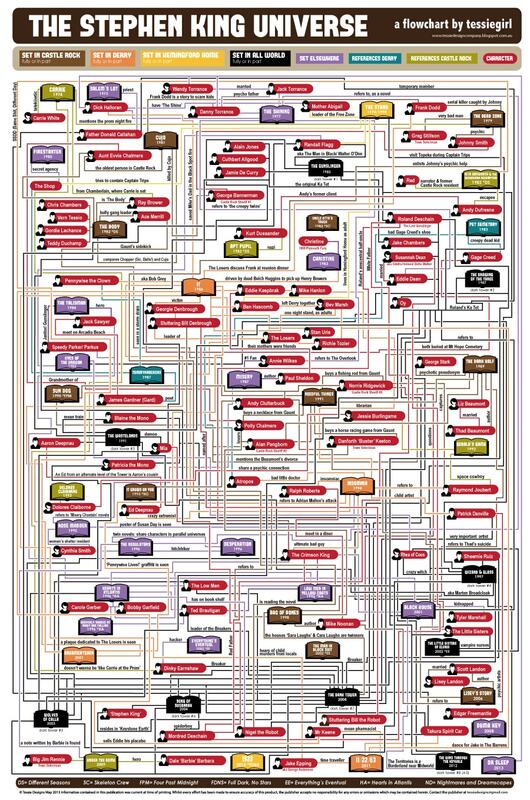 This flow chart is the work if TessieGirl, and you can buy the flow chart as a 2' by 3' poster.